Diptic is the easiest way to create beautiful photo collages on your Mac. 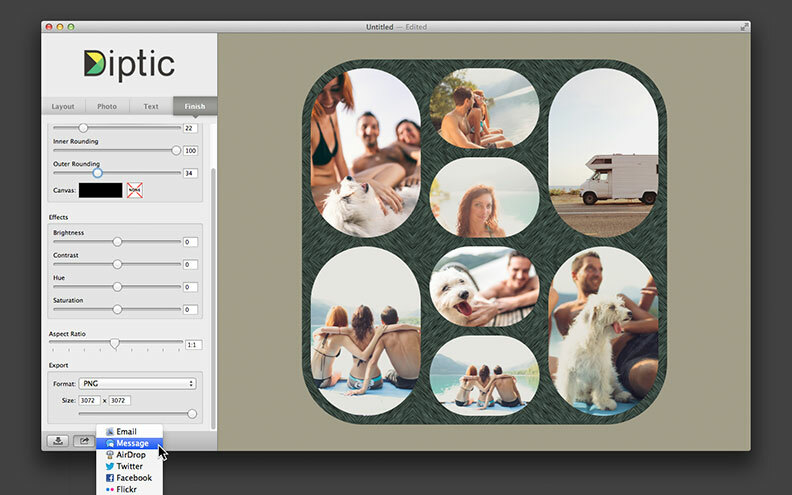 Featured in the Mac App Store Best of 2012 and selected as Apple’s Editors’ Choice, Diptic for Mac is a robust yet simple-to-use photo collage app. Start with one of 75 layouts and then select your photos. Position your images and customize the inner frame lines using the frame slider. 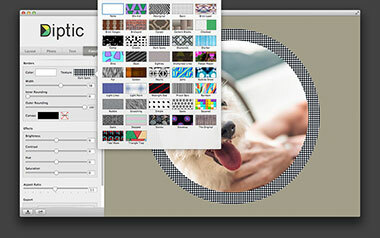 You can apply a filter, add text, and adjust border color, texture, width and curvature. Once your Diptic is ready, you can save it or share it via Share Sheets to email, Facebook, Twitter or Flickr. Perfectly Priced. 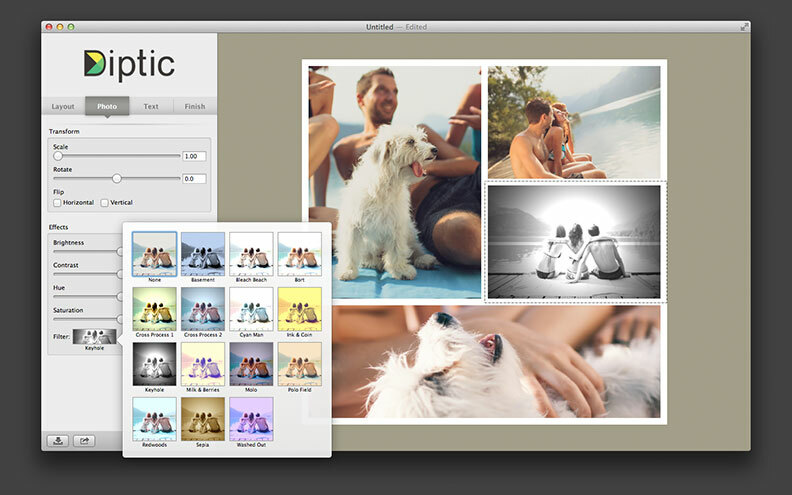 Diptic is affordable ($.99), offering many capabilities found in professional editors but in a more accessible format. Super Simple. Diptic is an easy-to-use, quick-action app, and you’ll be creating beautiful collages within minutes of downloading it. Considerable Quality. 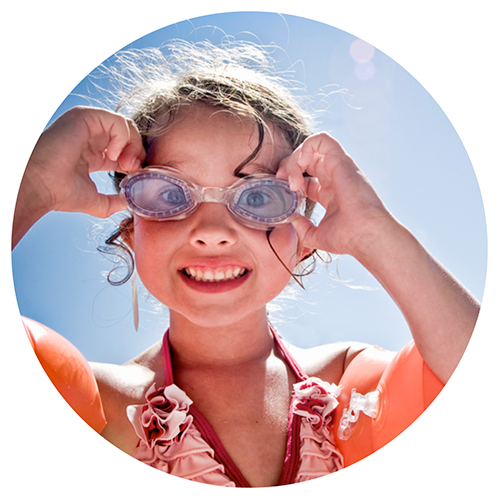 Diptic is fast and easy to use but produces high-quality images you’ll be proud to share with friends and family. Import photos from iPhoto and Aperture. Use the Media section of the open dialog box to browse your iPhoto and Aperture albums. 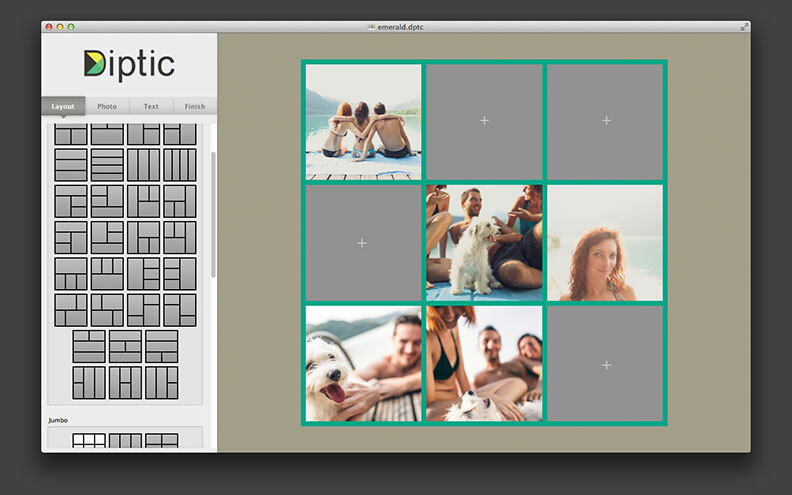 Alternatively, you can drag and drop images from your favorite photo applications into Diptic frames. Share your finished Diptics via Share Sheet (10.8+) to Twitter, Facebook, email, Flickr, etc. High-resolution export (max of 3072x3072), with option to choose JPG or PNG. Choose from 75 Layouts and combine up to nine photos in a layout. Customize your layout to better fit your pictures by sliding interior frame lines. Create rectangular Diptics (ideal for printing!) with the Aspect Ratio Slider. Round the inner and outer borders, as well as modify thickness and color, and apply interesting background textures. Apply filters to your photos. 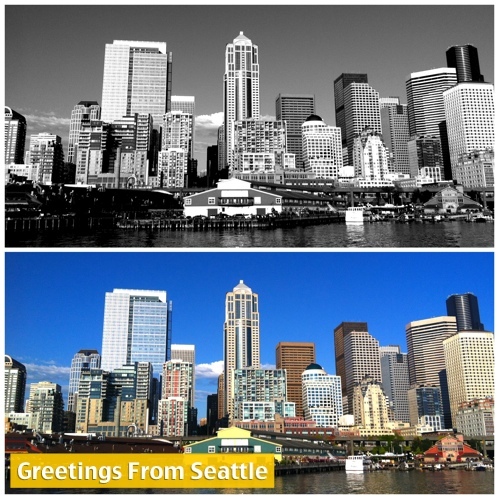 Adjust your images’ brightness, contrast, hue and color saturation. Personalize your Diptics with text captions. Adjust the text size, color, font, curvature, placement and more! Save your Diptic projects. The “.dptc” file format lets you save your Diptic projects and come back to them later. Undo edits! Press “Command” + “Z” to undo your last change or click Edit > Undo. Multi-Touch: The UI reacts to gestures with your Magic Mouse or Trackpad. Check out our Help Section or hit us up on Twitter @dipticapp. We welcome your feedback! Please contact us at support@dipticapp.com.